some pretty big milestones for Blushing Basics this week. A new car! woot! and your daughter is GORGEOUS!! oh my goodness - she is just a bundle of adorable! Those lashes are to die for! 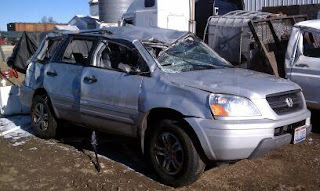 I was so grateful nobody was seriously hurt when I heard about the accident. Glad you could get such a great trade in. lovely post specially that cutie... she's adorable. I didn't know you were in an accident. Glad everyone is ok. I like the new car... but no more Ohio license plate! I've never seen such lashes on a baby! In fact, the only ones I've seen like these were the fake ones in magazine ads :) She's lucky and gorgeous.